to celebrate National Skin Cancer Awareness month Eucerin wants to help protect your skin and continue to put the health of your Skin First. with more than two million people diagnosed annually, skin cancer is the most common of all cancers but it is also the most preventable. check out the infographic below showing you what you can do to help keep your skin safe and healthy. 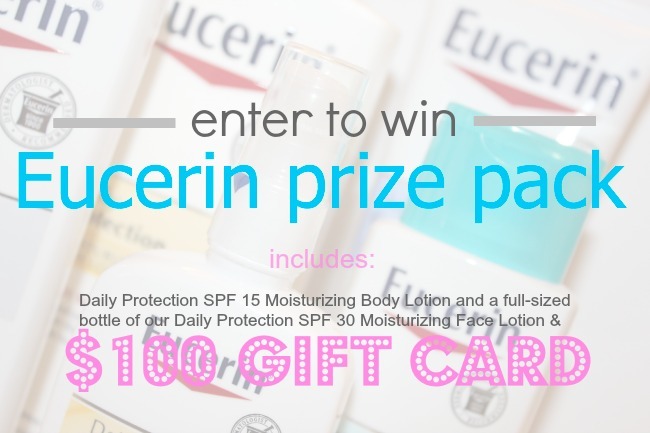 in honor of Skin Cancer Awareness month, Eucerin is offering one Blushing Basics reader the chance to win Eucerin Daily Protection SPF 15 Moisturizing Body Lotion, Eucerin Daily Protection SPF 30 Moisturizing Face Lotion, UV bracelets that turn blue when exposed to the UV rays and a $100 gift card! Eucerin Daily Protection SPF 15 Moisturizing Body Lotion – Helps protect skin from daily sun exposure with a lotion specifically formulated to moisturize and protect. This light, fast-absorbing formula with SPF 15 sunscreen provides 24-hour moisture and helps defend against sunburn. Eucerin Daily Protection SPF 30 Moisturizing Face Lotion – This lightweight, gentle broad spectrum SPF 30 formula with UVA/UVB sunscreens including zinc oxide and titanium dioxide helps defend against long-term sun damage and also provides effective moisturization. *don't forget to enter my Shabby Apple Giveaway and Conair Giveaway! You know us vampires have to be extra careful with our skin! I wear sunscreen every day, no matter what. Eucerin works great for my skin to protect and hydrate. Thanks! I'm very bad, I only use sunscreen in the summer! I need to start wearing more sunscreen! My mom always tells me I'm going to be a wrinkly looking 20 year old! I wish I knew then, what I know now, when it comes to skincare. fantastic prize - so important to protect our skin! I put sunscreen whenever I am stepping out the house. Thanks for this. I took the pledge, and I am always about taking care of my skin!! i like this brand as I have tried a few of their other products --- would like these as well i'm sure (: ty for the chance! drink a lot water every day! I took the pledge and commented on Eucerin's page. Thank you! I was not good about putting on a sunscreen when I was a teen. I now put sunscreen on faithfully. Thanks for the chance to win! We love Eucerin!